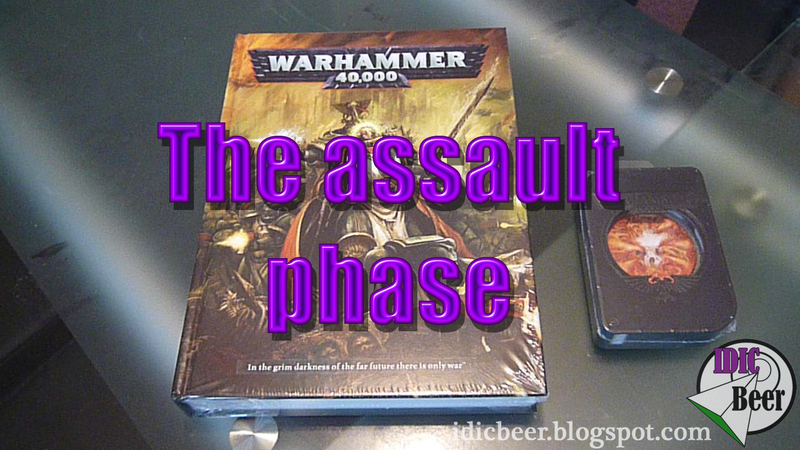 So, onto the assault phase and right away we read a change. The phase is now split into two sub-phases, 'Charge Sub-phase' and 'Fight Sub-phase'. It is split like this so that we are able to use a new concept rule called 'Overwatch'. First you declare which unit you want to charge, of which you have to be in range and have line of sight too. You then have a chance to resolve Overwatch, which basically lets your oppnent shoot at the assaulting unit before it comes in. You don't have to shoot, but if you do, you will be shooting at ballistic skill one. I can see this being useful, for even only one death, which will have to be taken from the front dude, could mean the unit is no longer in charge range! You then roll to find out your charge range, which in most cases will be 2D6", and then the models launch the assault the same as in 5th edition, closest model first etc. If your assaulting through difficult terrain you have to roll 3D6 and take the two lowest dice, reducing your initiative to one as standard. Next is the Fight Sub-phase, and the pile in move. This is now done in initiative order, so if the highest attackers initiative is five, any models that are not in base contact that are also initiative five are able to make a 3" pile in move to try and get into base contact. Pile in moves ignore difficult terrain, but do not ignore dangerous terrain! Models can only fight if they are in base contact, or within 2" of a model in base contact after it has piled in at its initiative step. The fighting takes place the same as it did in 5th, rolling to hit and wound as usual. Allocating wounds is also done the same as in the shooting phase, where the closest model takes the wound first. So basically the models in base contact at the initiative step take the wounds first, and then the next closest, when there are models the same distance away, the player who owns the models chooses where the wounds go. The wounds are able to spread through the unit, even out side of the two 2" range. Once a model has a wound allocated to it, you must continue to allocate wounds to it until is removed! You are also able to use the Fast dice rule to speed up the process whenever possible, just like in the shooting phase. The 'look out, sir' rule is also available in the assault phase, the same as in the shooting phase, to help keep Characters alive. Determining assault results have not changed and the losing unit has to take a Morale check, or fall back. The Morale rules have not changed. There is a new rule called 'Our weapons are useless' which lets you choose to automatically fail the Morale check to fall back if your weapons are unable to touch your opponent. Sweeping advance and the fall back move has not changed. Pile in at the end of the combat is also done in initiative order and is only 3". Consolidation is still D6" and once again activates any dangerous terrain tests, but not difficult terrain tests. Multiple combats is now slightly different, in that you will lose your plus one for the charge dice, and both units you assault would get their Overwatch shots at you. The targets are then split into primary and secondary targets, and you have to get all models that can go into base contact with the primary target before you can start moving into the secondary target. There is no initiative penalty for charging through terrain if all enemy units are already locked in combat or have gone to ground. The 'Fall back' rules looks to be the same as it was, but the 'Regrouping' rule is now different! You are now able to regroup if at least 25% of the unit is alive, and it has a chance to pass the test on a double one if it's under 25%. If successful, you can regroup 3", but dangerous terrain test will be activated as above. The regrouped unit can only shoot 'Snap shot' and nothing else. You are also now allowed to regroup even if there is an enemy model with 6"of you! Nice, thanks for the info. I don't know of I'll buy the rukebook so this is great for me! Thanks and keep the info comming. Can you throw in the rules for night fighting and how dangerous terain tests work now. As a Necron player it will effect my lists right off the bat. Have a good night out and thanks again for the info. Thanks for the very good summaries, I look forward to the rest of the series. Nick - thanks for posting all this, but I'm not over the jealousy thing.... haha. I've liked all the rules you've shared so far! I cannot wait to get my first game of 6th ed under my belt! Doesn't sound too promising! btw what time do you get up mate? Not usually this early... haha.